Intel held the high-end desktop crown for a number of generations until AMD came along with Threadripper. That doesn't mean Intel becomes a poor choice overnight, as the company has very firm plans to release consumer processors with up to 18 cores in the near future. 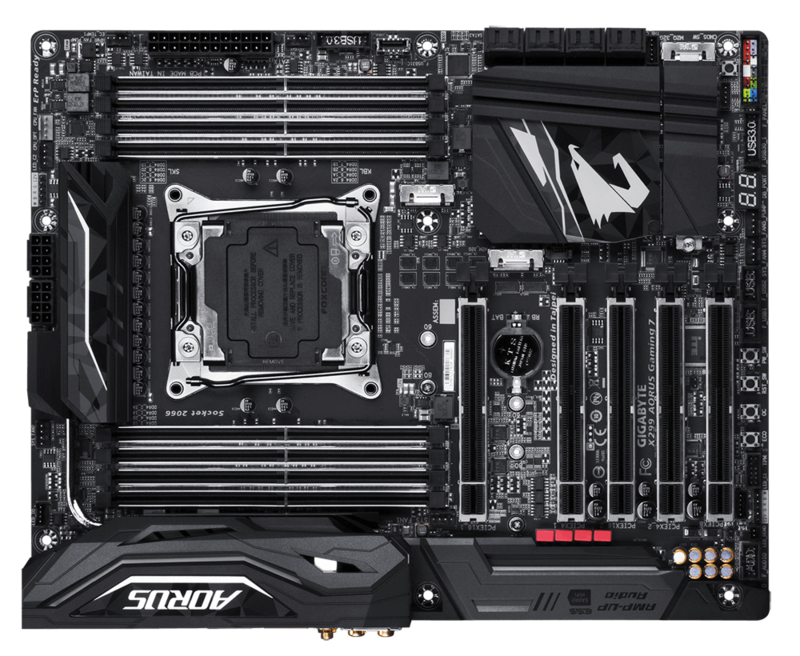 Powering all of these Core-X CPUs is a new chipset known as X299, and we put a couple of examples through the wringer when the platform launched in June of this year. 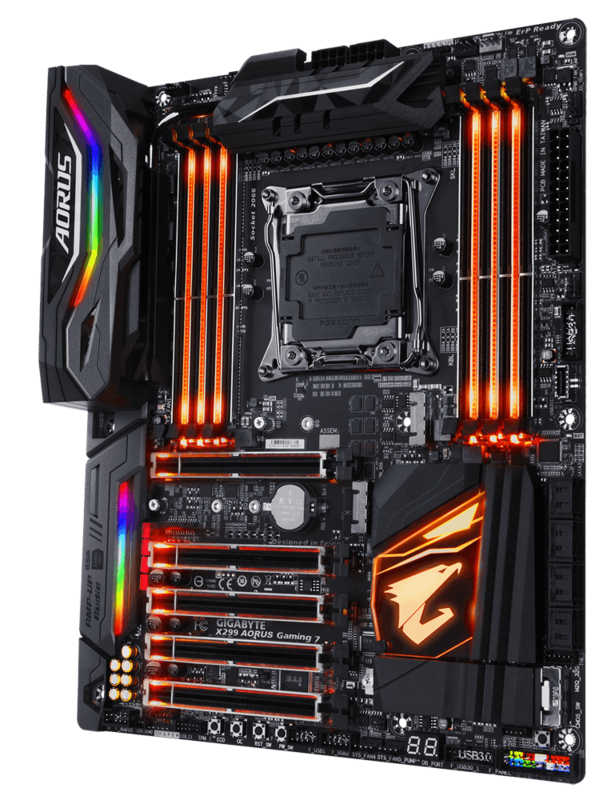 Gigabyte spin-off Aorus is carving out a name for itself as a provider of motherboards that include everything but the proverbial kitchen sink and the motherboard in for review today, the Gaming 7, is no exception. 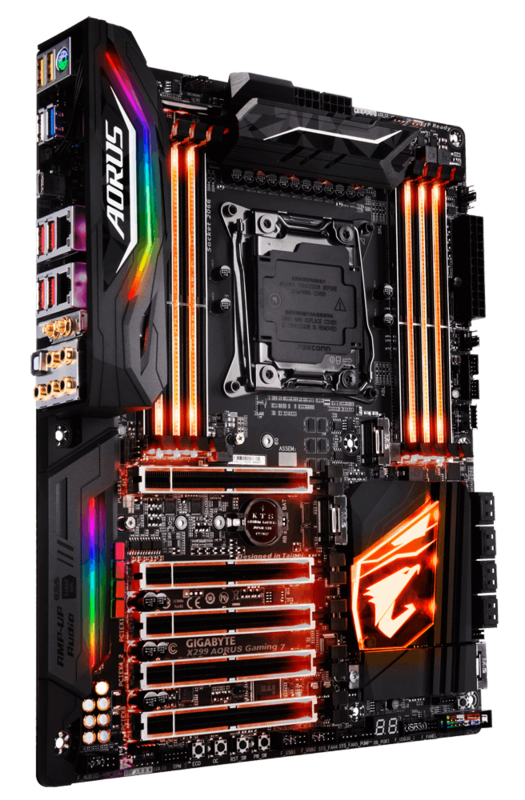 The first aspect you'll note on this board is just how heavy Aorus has gone on RGB lighting. All told, there's nary a location without it, but thankfully the lighting can be controlled from an installable app. Eight DIMM slots - all lined with LED lighting, of course - is standard, but what's surprising is the five full-length PCIe x16 and a trio of PCIe-riding M.2. 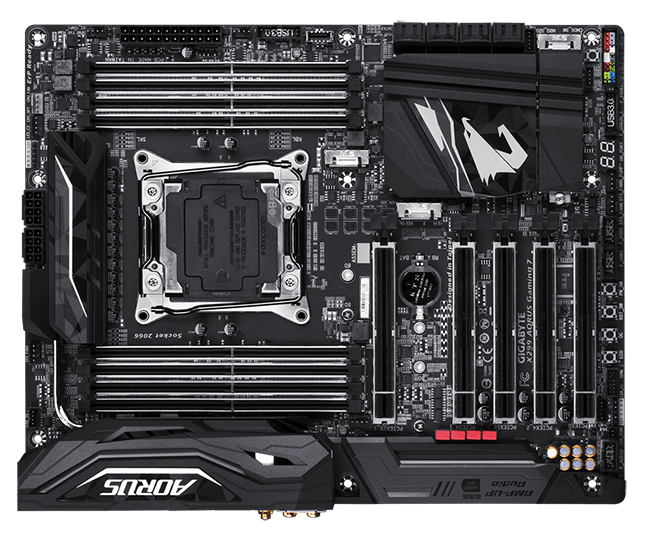 Adding in all this potential connectivity ideally requires a Core i9-7900X, or higher, but Aorus still needs to use a bunch of expansion switches to make this board work, and even so, the slots have to share lanes if they are all populated at once. And this is how Aorus begins to justify the £400 price tag attached to this board. What the company is saying, effectively, is that going down this route is reserved for users who need massive connectivity. 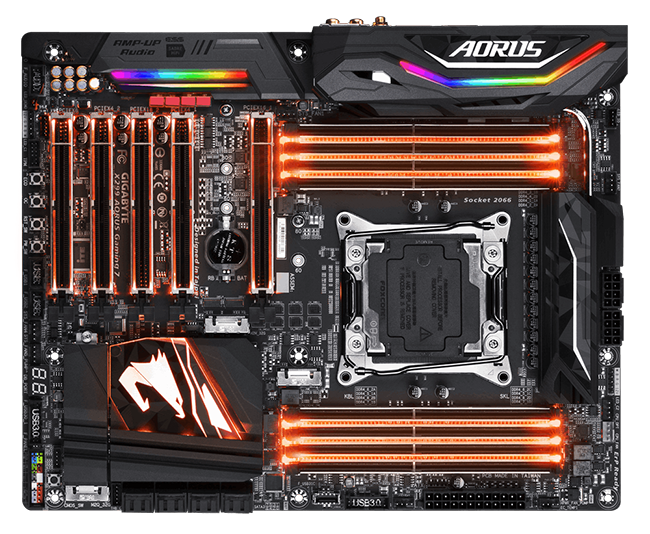 Looking at the board more closely, we can see that Aorus adds in the usual bevy of board-mounted buttons - Power, Reset, Auto OC and Economy - down at the bottom and moves the handy Clear CMOS to the edge, just below the large, RGB-laden heatsink that dominates the middle of the board. You'd probably only use a maximum of three graphics cards unless the rig is primed for mining. Said three cards will best go in slots one, three and five (all have an x8 link), but doing so will inevitably hide the onboard buttons and, looking across, the USB 3.0 header next to the debug LED. 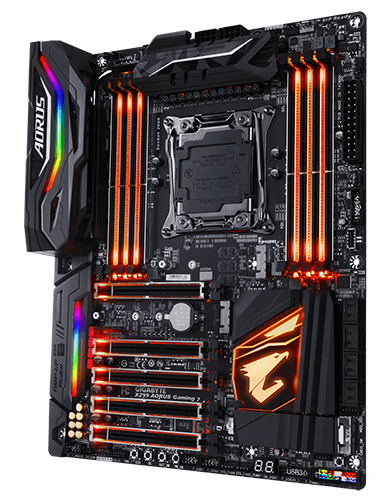 Aorus maximises cooling potential by installing eight four-pin fan headers dotted liberally around the board and, in a nod towards the high-end positioning of this model, there are a couple of 8-pin CPU power connectors, too. Aorus does well in housing so much without blocking-off vital ports and features. There's easily enough room around the socket to mount larger coolers and still be able to access the RAM, while the two primary heatsinks near the CPU are screwed into the board, not push-pinned, as we see on cheaper models. Really, at its £400 price point, which is £150 dearer than entry-level X299 boards, we'd only consider this model if going for a Core i9 chip. The rear is where it also remains interesting. Dual WiFi antenna points pair up to a Killer Wireless-AC 1535 controller capable of running at up to 867Mbps, representing a speed that's almost double what we see on more moderate X299 boards. Killer is in evidence again with its Gigabit E2500 LAN chip and it can team up with the WiFi for 'DoubleShot Pro' mode whereby the WiFi and Ethernet are combined for speeds of up to 1.867Gbps. It's kind of a shame that the other Nic is from Intel and not Killer, because using the latter would have enabled DoubleShot-X3 Pro for the fastest networking connectivity we have seen to date. Audio deserves a specific mention because whilst Aorus uses the tried-and-trusted ALC1220 Codec, the firm goes big on the analogue output by teaming it up with a high-quality Dac in the form of the ESS9018Q2C. We expect to see the same 'over-the-top' philosophy on the company's AMD Threadripper X399 boards, too. 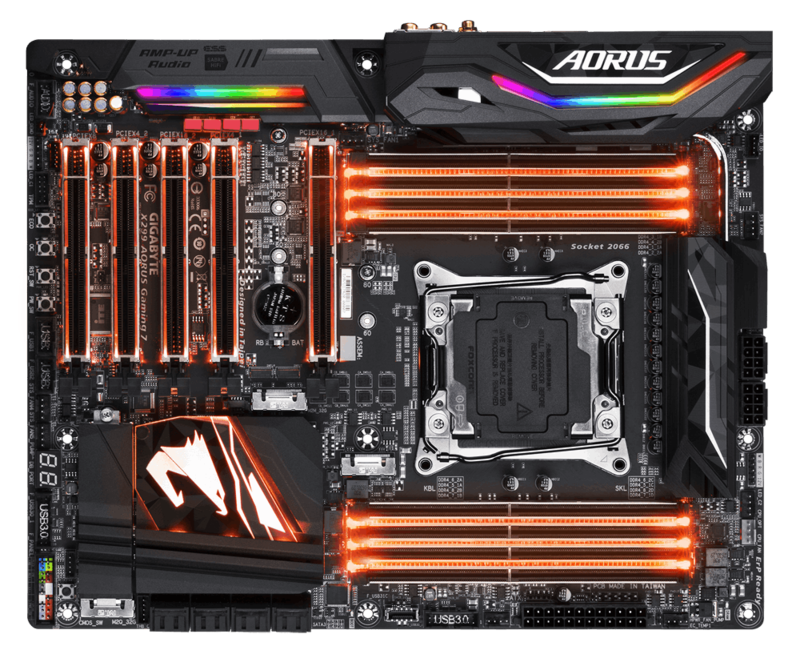 Turning our attention to peripheral connectivity, Aorus metes out USB 3.1 like confetti. There's Gen 2 support from a two-port ASMedia controller, split between the Type-C connector (one port) and shared amongst the four red slots (second port), meaning you cannot expect full bandwidth if plugging in lots of high-speed devices into them. Note that Aorus doesn't have Thunderbolt capability with the Type-C, if that's important to you. The other four USB 3.1 are Gen 1. Point is, if plugged in sensibly, the Gaming 7 has some serious peripheral storage mojo. 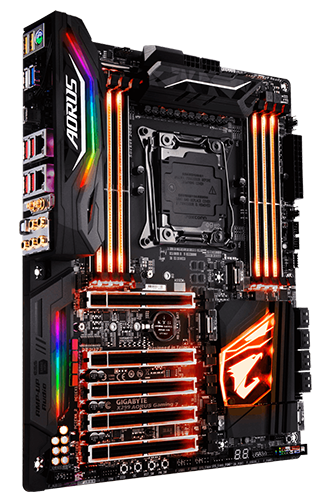 What's clear is that Aorus has tried to shoehorn almost everything into this board. It's expensive, of course, yet the company is of the thinking that anyone considering Core i9 isn't going to be phased by shelling out for a premium supporting platform. The BIOS, meanwhile, is identical to the Z270X Gaming 7's, so decent fan control and wide voltage regulation, though the GUI can feel a little slow at times.